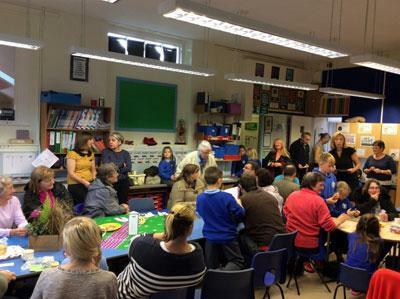 On Friday 30th September we held our annual Macmillan Coffee Morning in school. We had a great turn out of friends and family. 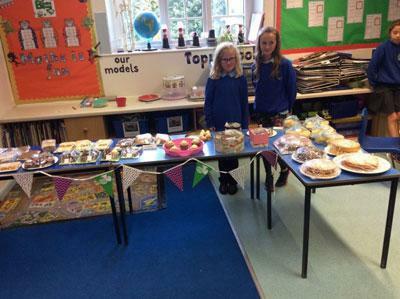 Our cake stall was very impressive thanks to all of the parents and staff that baked some delicious cakes and donated raffle prizes. We had some other fun stalls such as the coin challenge where we filled coffee cups with coppers and guess the spots on the cake. We also had a presentation for Rowena who is sadly leaving school after working here for many years. The reception children and Mrs Smith presented her with a gift from all of the staff and parents. We raised a fantastic £211 for a very worthy cause.